As we approach the Nuclear Non-Proliferation Treaty (NPT) Review Conference in May 2020 and “celebrate” the Treaty’s 50th anniversary, there is much talk of “bridge building” between the different perspectives on nuclear disarmament. The advent of the Treaty on the Prohibition of Nuclear Weapons in 2017 was the latest manifestation of the rift in the international community. 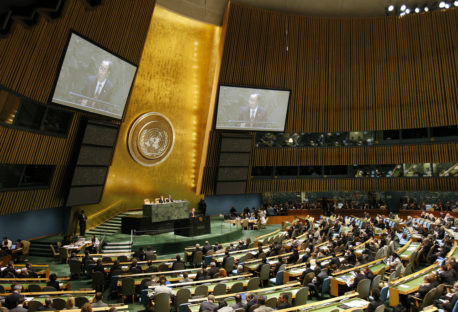 The Ban Treaty was supported by a majority of States not in possession of nuclear weapons, and is seen as an important and necessary legal measure upon which to build much overdue progress on nuclear disarmament. Perhaps unsurprisingly, nuclear weapons States object to this approach, criticising the Ban Treaty and alleging it to be detrimental to the NPT. Disagreements over the Ban Treaty will be difficult to bridge. Nevertheless, nuclear States should engage substantively and constructively with the humanitarian arguments underpinning the Treaty, rather than treating it primarily as a nuisance. Such a discussion would be welcomed by NPT member States and could aid in rebuilding trust in the disarmament discourse, vital to ensuring continued broad support for the NPT. Nuclear weapons have always been the subject of diametrically opposed views: “nuclear haves” insist on the value of nuclear weapons for international security due to their deterrent quality. In this understanding, nuclear disarmament may well be a desirable objective in the long-term but relinquishing weapons is not possible given today’s international system and security environment. In the opposing view, “nuclear have-nots” consider the existence of nuclear weapons and the concept of nuclear deterrence as highly precarious, morally questionable and the division of haves and have-nots, discriminatory. For States holding this view, nuclear disarmament is an urgent priority. Since 2012, the position of the “nuclear have-nots” has seen considerable consolidation in the context of the “humanitarian initiative”. Indeed, the catastrophic scope and effect of any use of nuclear weapons -intended or otherwise- was the focus of a series of international conferences in 2013 and 2014 in Norway, Mexico and Austria. The large body of scientific and expert evidence delivered at which was both serious and disconcerting. The wide-ranging humanitarian consequences of nuclear weapon explosions were shown to be significantly graver and more complex than previously understood; as being systemic, global and potentially irreversible. Moreover, the risks associated with nuclear weapons, both technical and human, were also higher than previously assumed. The risks increase with proliferation and the lowering of technical thresholds for nuclear weapon capability, and that no national or international response capacity exists to deal with consequences of such magnitude and complexity. The humanitarian initiative strengthened the evidence-based argument that nuclear weapons, by their mere existence, pose a far greater threat to international security than their ultimately unproven, yet highly risky, benefit as deterrents. Initially, the vast majority of States supporting the humanitarian initiative did not subscribe to the idea of commencing negotiations on a Ban Treaty. However, in the five years from 2012 to 2017, three key things happened to change that position: Firstly, the disconcerting findings presented at the three conferences moved many States to the conclusion that in order to prevent the catastrophic consequences of any use of nuclear weapons, a legal prohibition norm would be necessary. Secondly, it became clear in the run-up to, and during, the 2015 NPT Review Conference that little meaningful progress would be achieved on steps committed to by nuclear States under the much-heralded NPT action plan in 2010. Lastly, nuclear weapons States, fearing the humanitarian initiative could lead to a push for a ban, showed limited engagement or an outright dismissive attitude toward the initiative. However, this opposition, more than anything, galvanized support for the Ban Treaty approach. It was by the fall of 2015 that the legal prohibition of nuclear weapons began to seen as the only viable route forward for a majority of non-nuclear weapon States. The original objective of the humanitarian initiative was to start a facts-based discussion on the humanitarian consequences of any use of nuclear weapons and to gain a more thorough and up-to-date understanding of the risks associated with maintaining nuclear arsenals. In addition to injecting new momentum into the disarmament debate, it was hoped this would catalyse a discussion and lead to an alternative assessment of the security value of nuclear weapons. Regrettably but perhaps not wholly unexpectedly, since the adoption of the Ban Treaty in 2017, the nuclear disarmament discourse has all too narrowly focused on positions pro and contra the Treaty itself. Not only has there been little engagement in the NPT meetings preparing for the 2020 Review Conference on the substantive arguments that gave rise to the Ban Treaty, the vitriol against the treaty has been quite remarkable. 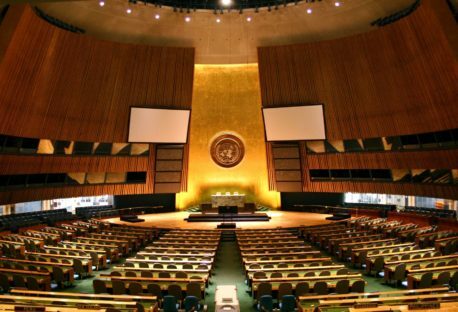 In addition to criticisms on the alleged shortcomings of the treaty and accusations it may undermine the NPT, nuclear weapon States have embarked on a sustained campaign of discouraging, if not to say intimidating, States from ratifying the Ban Treaty. The aim being to prevent or delay it from reaching the fifty ratifications required to bring its entry into legal force. There is strong resistance to accept any reference to the Ban Treaty in any outcome document of the up-coming NPT Review Conference. One nuclear weapon State even objects to referring to “humanitarian consequences” in the NPT because it implicitly links to the Ban Treaty. Conversely, supporters of the Ban Treaty find themselves obliged to defend against accusations perceived as gravely unjust. Hence, the two camps remain pitted against one another in a hopeless argument for and against the Treaty. This means that finding a way of dealing with the Ban Treaty will be one of the core challenges for the 2020 NPT Review Conference. A focus on the Ban treaty, rather than an engagement with its underlying argument, may suit nuclear weapon States very well. After all, it is a simpler task to argue that a Ban Treaty without the participation of nuclear powers could not be very effective. The alleged shortcomings of the treaty and criticism it may undermine the NPT deflect usefully from the absence of nuclear disarmament progress. In the noise created by discussions on the Treaty, nuclear weapons States avoid a harder conversation on the validity of the nuclear deterrence concept, particularly when set against today’s knowledge of the humanitarian consequences and nuclear risks. This conversation between all stakeholders has yet to happen, but is urgently needed given current security developments and a re-emphasis of nuclear weapons in the security policy debate. To date, nuclear weapon States insist that any nuclear disarmament progress is conditioned with the principle of undiminished security for all, which is code for maintaining strategic and military balance between them. In practice, however, this principle is an obstacle to a world free of nuclear weapons. A strategic and military balance was not attainable in the bipolar world of the Cold War, and is even less so in the complex, connected and contested world of the 21st Century. The Humanitarian Initiative and Ban Treaty Process have raised very serious questions about nuclear weapons and humanity’s collective undiminished security. It challenges the strategic and military balance focussed approach of nuclear powers. Before the Cold War nuclear “muscle memory” fully kicks in again, we must assess the role of nuclear weapons anew. In the absence of this, nuclear weapons proliferation may become inevitable and the complex architecture surrounding international treaties built around the NPT will erode further. While today there may be unbridgeable differences regarding the Ban Treaty, the urgent need to prevent the unacceptable humanitarian consequences of the use of nuclear weapons and risks this weaponry entails, must be of shared concern. Conversely, engaging in the debate may actually help nuclear States to find a way out of their current trajectory towards a new nuclear arms race. It would surely help them regain some credibility on nuclear disarmament lost in the eyes of the vast majority of non-nuclear weapon States. Alexander Kmentt is the Permanent Representative of Austria to the Political and Security Committee of the European Union. The views expressed in this commentary do not necessarily represent the position of the Austrian Foreign Ministry. The opinions articulated above do not necessarily represent the views of the ELN, the BDI, or the roundtable participants. They also do not necessarily reflect the position of the ELN or any of its members. The ELN’s aim is to encourage debates that will help develop Europe’s capacity to address pressing foreign, defence, and security challenge. Ban the Bomb? Or Bomb the Ban?